The thyroid gland is a small, butterfly-shaped gland located in the base of the neck just below the Adam’s apple. Although relatively small, the thyroid gland plays a huge role in our body, influencing the function of many of the body’s most important organs, including the heart, brain, liver, kidneys and skin. Ensuring that the thyroid gland is healthy and functioning properly is vitally important to the body’s overall well-being. An estimated 15 million of Americans have undiagnosed thyroid problems. At Advanced Urgent Care & Occupational Medicine we can help with early detection of thyroid conditions. How common is thyroid disease? Thyroid disease is more common than diabetes or heart disease. Thyroid disease is a fact of life for as many as 30 million Americans – and more than half of those people remain undiagnosed. Women are five times more likely than men to suffer from hypothyroidism (when the gland is not producing enough thyroid hormone). Aging is just one risk factor for hypothyroidism. How important is my thyroid in my overall well-being? The thyroid gland produces thyroid hormone, which controls virtually every cell, tissue and organ in the body. If your thyroid is not functioning properly, it can produce too much thyroid hormone, which causes the body’s systems to speed up (hyperthyroidism); or it can create too little thyroid hormone, which causes the body’s systems to slow down (hypothyroidism). Untreated thyroid disease may lead to elevated cholesterol levels and subsequent heart disease, as well as infertility and osteoporosis. Research also shows that there is a strong genetic link between thyroid disease and other autoimmune diseases, including types of diabetes, arthritis and anemia. Simply put, if your thyroid gland isn’t working properly, neither are you. How do you know if you have a thyroid problem? First, you must understand how to recognize the symptoms and risk factors of thyroid disease. Since many symptoms may be hidden or mimic other diseases and conditions, the best way to know for sure is to ask your doctor for a TSH (thyroid-stimulating hormone) test, a simple blood test to verify your thyroid gland’s condition. Also, take a minute and perform a self neck check. And because thyroid disease often runs in families, examinations of your family members and a review of their medical histories may reveal other individuals with thyroid problems. What are some of the reasons to consider a thyroid evaluation? Family history: A familiar place to look for thyroid disorder signs and symptoms is your family tree. If you have a first-degree relative (a parent, sibling or child) with thyroid disease, you would benefit from thyroid evaluation. Women are much more likely to be thyroid patients than men; however, the gene pool runs through both. Prescription medications: If you are taking Lithium or Amiodarone, you should consider a thyroid evaluation. Radiation therapy to the head or neck: If you have had any of the following radiation therapies, you should consider a thyroid evaluation: radiation therapy for tonsils, radiation therapy for an enlarged thymus, or radiation therapy for acne. 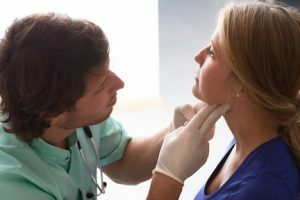 To help with early detection and in some cases help you find lumps or enlargements in the neck that may point to a thyroid condition, you can perform a simple Neck Check self-exam. Here is a step-by-step guide. Hold the mirror in your hand, focusing on the lower front area of your neck, above the collarbones, and below the voice box (larynx). Your thyroid gland is located in this area of your neck. While focusing on this area in the mirror, tip your head back. Take a drink of water and swallow. As you swallow, look at your neck. Check for any bulges or protrusions in this area when you swallow. Reminder: Don’t confuse the Adam’s apple with the thyroid gland. The thyroid gland is located further down on your neck, closer to the collarbone. You may want to repeat this process several times. If you do see any bulges or protrusions in this area, see your physician. You may have an enlarged thyroid gland or a thyroid nodule that should be checked to determine whether further evaluation is needed. 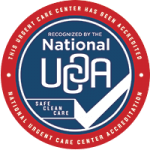 For more information contact Advanced Urgent Care & Occupational Medicine at 303-659-9700.